A study in reductionist philosophy, Ho boils down the essential elements of a 4X game, and presents it in a superb interface. The result is a game that’s fast paced and fun, rather than buried in minutiae. Released on: Macintosh circa 1991. Windows version (Mac 4.x) in 1997. iOS version 2012. Comments: At the other end of the complexity spectrum from Pax and MOO, Spaceward Ho! is simple in terms of features, but combined what it had with great graphics, humour, and superb gameplay. Spaceward Ho!‘s creation is another one of those “right place, right time” stories. Delta Tao started life in 1989 the 1980’s when Joe Williams and Tim Cotter wrote Color MacCheese, a simple but powerful 32-bit painting program for the Mac. At the time the market wasn’t as stratified as it is today, and there wasn’t a four-hundred pound PhotoShop out there. The program sold well and launched the company. Joe had always wanted to write a space exploration game, influenced by the seminal Reach for the Stars. At the time he was too busy with other things though, and put it off. That’s when Peter Commons, one of MacCheese’s earliest users, mentioned that he was interested in programming the Mac for a living. My mantra was “Keep it clean.” Every time a feature would threaten to sneak in that would make the game more complicated (Complexity good; complication bad), I would insist that the game be made less complicated in some other way to compensate. The end result is that version 4 has four times as many features as version 1, but is even easier and faster to play. A port to Windows was started by Paul Toth in 1996 and released by New World Computing in 1997. More recently a 5.0 version has been released for the Mac. Again I return to a theme that pervades these articles – playability. Ho! is one of the most playable games of the genre I’ve seen. I’ve been playing it for about four years now, and it’s still the one I start up for a hangover cure on a Saturday morning. Ho! isn’t going to compare on a features checklist with something like MOO, nor are its graphics or cinematics going to turn any heads, but it is likely the most fun of all of these games. I highly recommend it. Gamers will argue endlessly about which game is ‘best’. Lately, ‘better’ has come to mean ‘more goodies’. With computers rapidly increasing in ability, game developers have responded by heaping on features, cutscenes, subplots, you name it. All too often they forget to make games fun to play, and isn’t fun what it’s all about? That’s where a game like Spaceward Ho! comes in. You can start it up and blow up the entire universe in half an hour, loving every second of it. Ho! picks what’s good about the genre and dumps the rest. The result is a game that’s lean, tough, and oodles of fun. Yikes! This couldn’t be simpler? That said the game setup could definitely use improvement. This should have been a couple of pop-ups at most, but look at the annoying multi-part dialog they ended up with. Uggg. And this is only step one of an annoying multi-step process. The game can be played by up to 20 players, computer or human. The system for “networking” these users was to share the game file on a server. Thus after the basic setup you were forced to name the game and save it out, then wait for other players to join. Essentially, it makes you walk through the process of setting up the most complex possible game, even in the cases where it’s just you against some computer players – which is likely 99% of the games played. On the plus side, this system did give the game some additional flexibility that most other games didn’t have in terms of multiplayer support, namely supporting more than one player on a single machine. Players on the local machine open that saved game, but enter a different user name. Once everyone is in they take turns using the “End Turn and Switch Players” command. How useful that is in the days of iPhones is highly debatable. Meanwhile other users are connecting to the same game over the network. Using Ho‘s game finder you can find and connect to a running game without any additional setup, the game finder knows the location of the file on the network and does all the setup for you. All of this was possible due to the Mac’s super-easy networking setup and sharing software, AppleTalk. Since support for other common networking protocols wasn’t as nicely wrapped up in a single package, internet play was out, along with Windows users (later addressed). A version with built in internet support would be a big bonus these days, and the game really should short circuit all of the setup steps if you’re playing only against the computer. 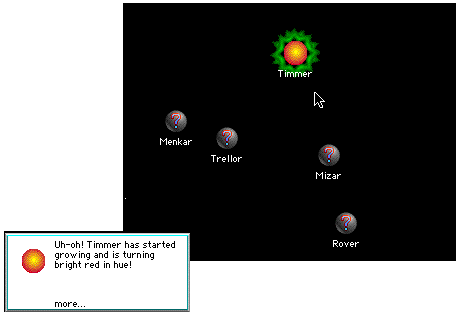 The game is based around a main screen dominated by a large map of all the planets in the galaxy. You can click on the planets to get additional information displayed in the upper left of the screen, although this was of limited use. 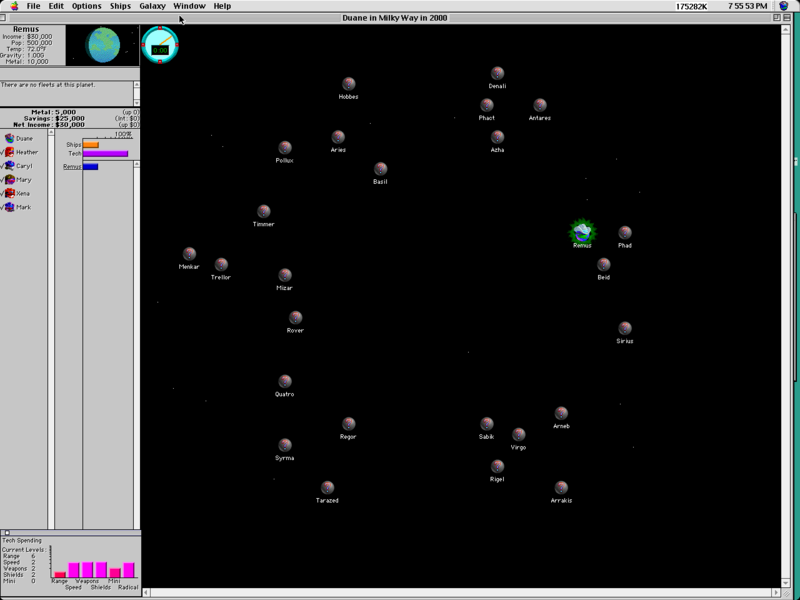 Selecting a planet also displayed any ships in orbit in the area under the picture. They can be sent to another planet simply by selecting them in this list, then double clicking on a destination planet. In the upper left corner of the map window is a clock, which is used to advance the turns. In single player games the turn advances when you click on it, but in multiplayer games the turns click down in time so you can’t have any users slowing up the game by not entering their moves. Typically the timer is set to a minute. Each player starts with one planet. Llike most of the empire building games it’s perfectly suited to your race’s physical characteristics – which makes sense really. Unlike most newer games, the planets are the only ones in the system. The planets themselves come with a temperature, gravity, and an amount of metal. 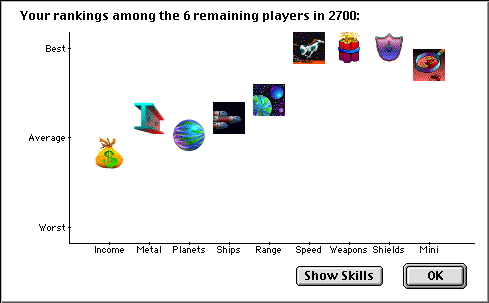 In addition you start with a number of ships and cash depending on the skill level you selected. Your race is looking for planets with a specific gravity and temperature. Temperature you can change by investing money to terriform the planet. Gravity you can’t change however, you have to live with what you get. The difference of temperature and gravity from what your race wants defines how much it will cost to maintain a colony on the planet, and how large it can grow. Planets close to what you want will eventually start generating more in tax than they cost to run, and that’s how you fund your empire. Those on poor planets will never become profitable and are best strip-mined and then adbandoned. Below the list of ships displayed on the left side of the screen is a list of your owned planets and the amount of money they’re currently generating (often a negative amount). Beside each planet name is a small slider, dragging it sets the amount you spend on terriforming the planet. For those planets that will never be profitable it’s best to drag this to zero, but for better planets it’s likely a good idea to increase the spending, if you can afford it. In addition this area controls how you’ll spend your overall income that’s left over after spending on your planets. 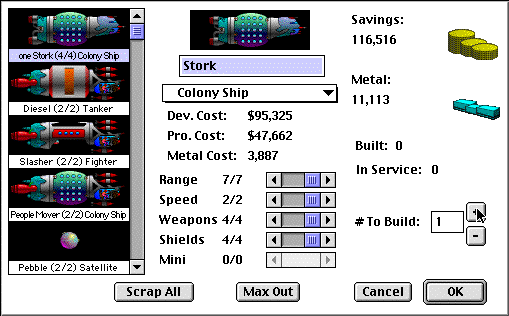 Using a similar interface you can divide the remaining money into research, or set it aside for buying new ships. Surplus or debts both generate 15% at the bank, so it’s worth it to try to use the “ship” spending to set aside some money in order to get some investment income. The other big factor in the game is metal. Each planet has a fixed amount of metal available for mining, and once it’s gone, that’s that. Metal quickly becomes important in the game, and often games end with a dull thud because everyone runs out of metal and can’t build any more ships. Money (based on population) is the limiting factor early in the game, at the end, it’s metal. Generally early-game research focusses on weapons and shields, with mini and radical in the late-game. While the explore, expand, exploit portion of the game is going on, you’re also spending money on researching newer technolgies. Again, the game keeps this simple. Instead of specific technologies with different abilities, you simply gain more ability in one of your researched areas: speed (which controls not only how fast your ships are, but who gets to attack first when meeting) , distance, shields, weapons, miniturization or ‘radical’. Miniturization is useful later in the game, by dumping money into this area you can reduce the amount of metal you need to build ships, although it makes them terribly expensive. Another nice addition to the game is the “Radical” area of research. Spending money on this area will result in seemingly random advances. 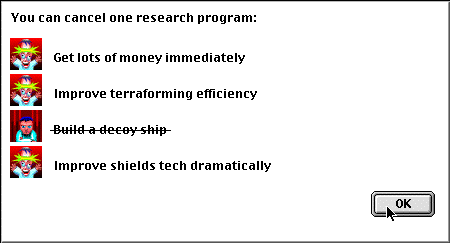 Every time a radical advance is made, four more potential breakthroughs come up, and you can select which of the four is least interesting to you and kill it’s funding. One of the other three will eventually be developed, but which one is random. Radical technologies can affect all sorts of things; you might suddenly boost your weapons tech from level 8 to level 12, allow you to mine more metal from each planet, steal technology from an opponent, or make mining or terriforming more productive. It’s simple and well thought out. I’m making a new class of colony ship with the latest tech. Note the cost associated with developing the new class. The act of building ships and maintaining fleets is also a simple task. Selecting any one of your planets and double clicking brings up the build dialog, and you can select a class of pre-defined ships and then ask for a number to be built. Any planet can build as many ships per turn as it has population, and since you often build only low tens of ships at a time, planets are essentially set up for ‘full production’ a turn or two after landing. Of course you often go to the ship build dialog to find that you have new techs you can use in your ship designs, so the same dialog is also the ship design system. Design a new ship and that design is selected and ready to build, along with a custom name based on its class and its own icon. Click the Max Out button and this all happens with one mouse click. This is a classic example of focusing on playability. The cost of a ship goes up with the amount of technology relative to your current limits – a low tech ship for a high tech race is cheap. Another sensible feature is that there’s an additional design fee as well, meaning that not only do you have to pay to build the ships, but for the cost of making their blueprints. Probes get a bonus in speed and range, but lose fighting ability. Figthers are the basic fighting unit of the game. Dreadnoughts are super-powerful, able to take on huge fleets of similar tech-level fighters, but cost an arm and a leg in both cash and metal to build. Satellites have no movement ability, but are cheaper to build that the same fighter with no engines. Colony ships carry 10000 people to another planet for taking it over. They take one turn to fill, taking people off of the planet they’re above. Tankers allow you to move from planet to planet without owning them, without a tanker in your fleet your ships will run out of fuel once they’ve travelled a total of their “distance” tech without topping up at one of your planets. In addition there’s two special ship types, both of which can be created only through radical research. The Decoy is a super-simple ship that’s cheap to build, it makes for a great el-cheapo scout. The game claims they are useful for fooling other players into thinking your fleets are much larger than they are, but I never found any value in that; the computer doesn’t run scared when it sees a large fleet, nor does it even know what size your fleets are as far as I can tell. The other is the Biological. Bios are weak in fighting terms, but are cheap and take up no metal to build. In a metal starved game a huge fleet of bios can turn the tides of war. Bios also need fuel, but they get it by eating people on your home planets, if they don’t get a chance to eat they’ll starve and won’t be able to move. This also means that they can make it difficult to colonize a planet when first taking it over with bios. If you send in a fleet of them to wipe out an enemy colony, when your colony ship arrives to the bios will eat the colonists. Metal scrounging grows more important with time, and the game allows you to scrap ships and get some of their metal back. This is actually quite important because in mid-game the tech levels are progressing very quickly and your ships become obsolete after even a few turns. At the same time your miniturization tech should be improving, which means that scrapping 10 of your older designs may yeild enough metal to make 2 or 3 of your newer ones. The colony ship never had a chance, but the population managed to take out two of my five fighters. Ship to ship combat only takes place when you’re in a system, not between them (space doesn’t really ‘exist’). You can choose to see only the results of combat, or if you wish you can watch a simple animated display of what happened. In one annoying bit of interface, you can actually see the outcome of the combat before seeing the animation. The animation is purely for display, you have no control over the battle. When over an enemy planet, after killing any ships and sats in orbit, you then have to then duke it out with the population on the ground, who fights with the highest tech levels – it’s possible to blast away a number of older ships only to be wiped out by the people on the ground fighting with much newer equipment. At the end of battle parts of the destroyed ships will fall to the planets, another potential source of metal income. Colonization is the name of the game, and most others like it. In this case it’s as simple as flying a colony ship over an uninhabited planet. Leaving the ship there for one turn after dropping colonists will refill the ship (as people are born), and off you go to the next planet. One problem is that enemies shoot at your colony ships first, so it’s important to make sure they’re well shielded if your colony ship is a part of an attacking fleet. Even with strong shields you often have a fleet of enemy ships all firing first at your colony ship, so in most cases you have to leave it behind in a follow-up fleet (although I never tried fleets of powerful colony ships…). Diplomatic relations are modelled in the game, along with trade. Again this is a model of simplicity. To ‘offer’ an alliance to another player (even a computer player) you open the Alliances dialog and click on the icon representing one of the other players. This moves them to the left in the dialog, from “I Don’t Like Them” (enemies) to “I Like Them” (friends), to “I Really Like Them” (allies) at which point another click sends them back to “I Don’t Like Them”. For all of the complex setup and rules of other 4X games it seems they all boil down to this anyway, so Ho has it right in my books. Oddly enough this dialog (and the message dialogs) uses generic ‘planet’ icons to represent players, even though the rest of the game has custom icons for each player. The computer works surprising well here, and responds reasonably well to requests based on who’s fighting who. A neighbour is unlikely to ally with you because you’ll likely be fighting for the same resources, but on the other hand it’s quite common to get requests from computer players on the ‘far side’ of a common foe. These alliances can come in handy, often when in dire straights, the computer player will give up and turn over their planets to you. The offers are also often based on the relative rankings of the players. Ho also includes the ability to send messages back and forth. You start by selecting a player to send the message to in one dialog, and then moving to a dialog showing a list of icons for ‘bits’ of a message (I always felt the two could be easily combined into one though). Messages are created by stringing together these message bits by clicking on the icons. For instance if you click on the “I Like” icon, the icons change to show a list of the existing players. Then you can select one of these, forming the complete message. The same system can be used to ask for money or metal, and the game also includes the ability to send a text message, useful for talking to other human players. Again the computer does a fine job here. 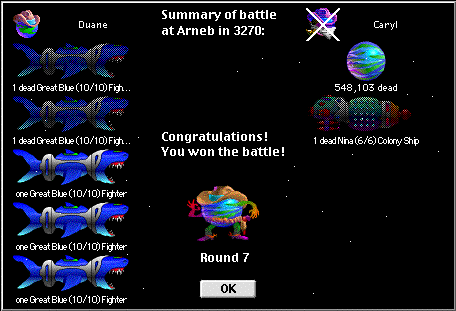 Often after attacking a heavility defended planet I’ll get a taunt from the opposing computer player, but if I win it’s a “$@*$&@”, expressing their ‘concern’. To make the game a little more interesting, Ho also has some stars randomly go nova after some length of time. Although this can wipe out a colony, it also sends massive amounts of metal into space. This falls on your nearby colonies (often killing numerous people) and since this happens typically late in the game, it can be a handy source of metal income. In addition Ho includes the ability for any player to declare Armageddon, this sets of a device that makes one quarter of the stars in the galaxy start to nova. As you might expect, this is a ‘hail mary’ device, and interestingly I’ve never seen the computer player try it. 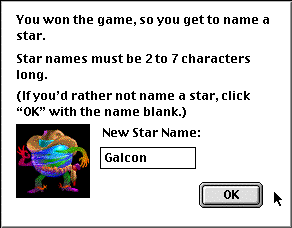 One thing I always liked about the game is that if you won you got to enter the name of a planet which would then be used in future games. In addition it would remember names of the players and ships, and use them in the future as well. It’s a nice addition that gives the game a feeling of history. Spaceward Ho! , the official Delta Tao page for the game. Spaceward Ho! FAQ maintained by Ben Beecher and Brian Davies. There’s a text version of the FAQ here (ftp). Joe Williams for helping out with the history. Dwane Apling, for some of the screen snaps, and Harley Balabanian for the rest. I’d even buy it if the company still sold it! Me too! I would buy if there were a version for modern Macs or for Windows 7. Managed to get Spaceward Ho running on a modern computer! First you’ll need to install one of these emulators: http://www.columbia.edu/~em36/macos9win.html for Windows, http://www.columbia.edu/~em36/macos9osx.html for Mac. Then you’ll need a copy of the game, search online and download a version. Don’t worry if it’s a .sit file, the emulator comes with a working version of Stuffit that should be able to open it. Boot up the emulator, click on Computer (opening up the filesystem on your actual computer), navigate to the file, copy it to the MacOS9 hard drive (icon on the desktop), unarchive if necessary, and the game should hopefully work!